Live the ultimate paintball experience with Delta Force in Kent! 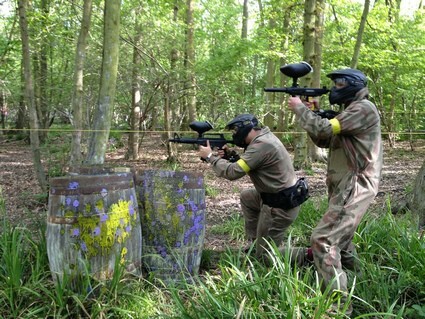 Those on the lookout for some intense paintball fun south of London are in luck; two of our 28 nationwide centres can be conveniently found in the verdant county of Kent, including one right on the doorstep of London. The South East London Paintball centre is located in Orpington and features several of our classic game zone formats, including capturing (well, raising) the flag in Castle Wallenberg, hostile takeover in Viet Cong Village and the ever-popular ‘speedball’ zone – be prepared for super-quick respawns and eliminations! 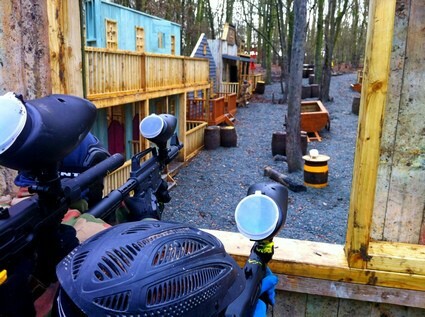 Not to be outdone, the Kent Paintball centre at Westerham offers an incredible seven unique game zones for players to try out paintball tactics and manoeuvres. How about trying your hand at defending the American President on his tour of the UK from covert insurgents? Use the awesome movie-quality props as your cover and sniping positions, including two double-decker London buses, black cabs and phone boxes! Or maybe you would prefer to be part of a band of outlaws in a dangerous Gold Rush mission; carefully take out the defending constabulary as they look to protect what isn’t rightfully yours! For many eager paintballing members of the public, it is the prospect of wielding a slick semi-automatic that gives them that extra buzz on the battlefield. We are proud to supply Inferno MKIIs, Tippmanns and M16 upgrades, all highly accurate and reliable with the latter having the added advantage of a built-in sight, extended barrel, adjustable stock and removable magazine. Along with some awesome pyrotechnics, riot shields and other equipable gear for hire (battle packs, body armour etc. ), our equipment is unrivalled in the paintballing industry. We don’t do things by half-measure! Billericay Paintball receives 5 star Trip Advisor award! Delta Force Cardiff: the ultimate paintball experience in Wales! Hen paintball parties: the ultimate experience for girls!